Well, not literally . . . but they are the masterminds behind Urbn Timber, a successful live edge wood products business in Columbus, Ohio. The original business concept, however, began with Hillyard. At age 20, he became a woodworker after graduating from the University of Rio Grande in 2009. At this point, he longed to build furniture. “It was a dream of mine to be able to salvage trees that had either been blown down or cut down to make room for new construction, and then build finished pieces out of it. 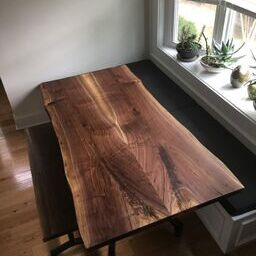 Live edge furniture had gotten very popular and that’s what I wanted to make,” he adds. After buying lumber locally from other woodworkers for building furniture, he decided in 2012 to buy his own portable sawmill, a Wood-Mizer. He drove around the area with his father’s dump truck and mini excavator gathering blown down trees. Using his Wood-Mizer, he converted the logs into 4 quarter dimensional lumber and continued making furniture. Nearly four years later, Hillyard teamed up with Sherman and Sirak to form Urbn Timber. 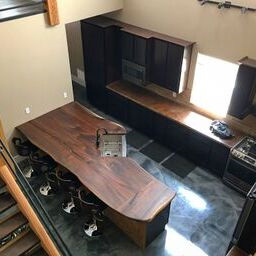 The company opened in January 2016 focusing on creating unique live edge boards from their Wood-Mizer sawmill. Live edge or natural edge is a style of furniture which incorporates the natural edge or contour of the wood into the design of the piece. This is in contrast to the squared edges of dimensional lumber. 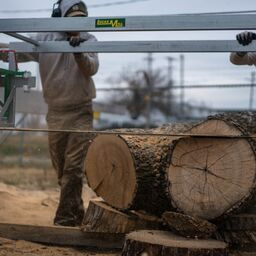 Initially, they began their small sawmill business operating only a Wood-Mizer, but a few months later added standard woodworking equipment such as jointers, a planer, table saw, and custom-made flattening jig. “We’re now a log to table company,” says Hillyard. 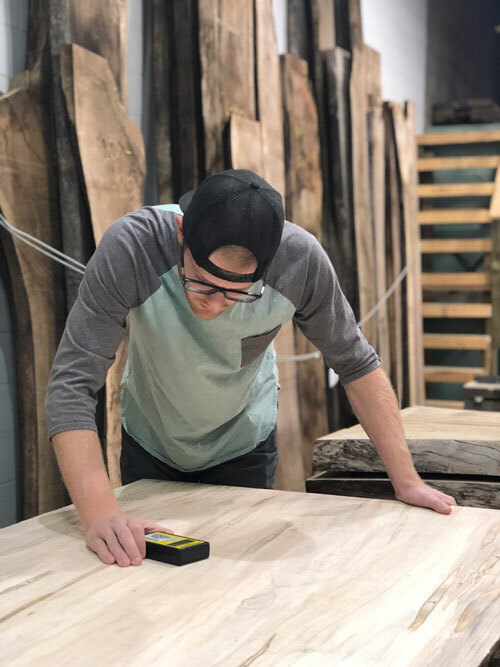 The trio primarily builds custom-made solid flat surface items such as dining tables, conference tables, kitchen countertops and islands from trees grown in Central Ohio, including cherry, ash, hickory, maple, oak, sycamore, and walnut. Occasionally, they’ll work on other species, including Osage and locust. All work is done in-house with no outsourcing of labor. They work inside a 3,600 square foot woodworking facility, which includes a 1,200 square foot metal shop. “We have a metal worker running the metal shop. He makes metal bases to hold up the wood. We obviously do wood on wood construction, but a lot of our stuff is standing on metal. 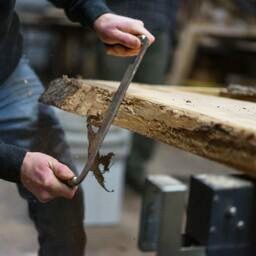 So if somebody comes to us, they can get both the woodwork and metal work done right here,” he declares. Their customers range from local homeowners and businesses to woodworkers. Although their current focus is local, they have sent lumber and finished products to companies and woodworkers in other states and Canada. “Some customers buy a raw slab and take it home to work on their own or they buy a finished item from us. If they don’t have the machines to deal with it on their own, we can process it and make cuts and they can go home and finish it,” remarks Hillyard. Like any mill, Urbn Timber has its challenges. Sometimes they get logs with nails or lag bolts from swings and such. There’s always a risk every time they open up a log. “That’s why big sawmill companies don’t want them. There’s always a chance they’ll saw into hardware and no saw really likes metal,” Hillyard says. 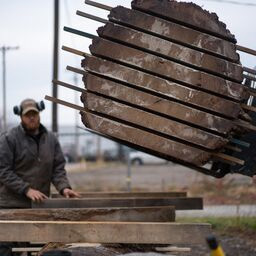 When logs arrive at their facility, they’re cut into slabs and air-dried for six to 18 months, depending on their species and size. After air drying, Hillyard and his partners take a moisture reading of each board. “We put Wagner’s MMC220 moisture meter on the board and draw an outline around it with a marker. Then we’ll write the moisture content (MC) of that area on the board and the date right beside it. So we have a little legend on that slab as it goes through the drying process,” he says. “We really like the fact that the Wagner meter is pinless and very accurate. We once used a Delmhorst with a slide hammer and 3-inch long pins. We kept breaking the pins in the board. Plus, it’s disheartening when you’re looking at a beautiful board you’re getting ready to build into a table and you see two giant peg holes in the middle where you had to check the moisture. 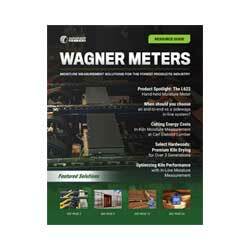 “When we started looking for a pinless meter, we noticed others in the industry using the Wagner meter. That gave it credibility,” he adds. Hillyard says he’s surprised at the number of woodworkers who don’t own a moisture meter. “It always blows my mind. When you’re working with wood, wood moves. The only way you’re going to ensure your project is staying flat and square is by knowing the MC of your wood. Not having a moisture meter is like cooking without a thermometer on your oven,” he declares. Once air dried, the logs are put into a de-humidification kiln for 10 to 12 weeks. This lowers the MC to between 6% and 10%. “We only dry about 3,000 board feet every three months. And during that time we’re monitoring the MC about every two weeks with the moisture meter. We’re also checking the kiln’s temperature and humidity every three days to make sure it’s on par with our schedule,” says Hillyard. “It’s very important for us to monitor how fast the material is drying. We don’t want to dry it too fast and introduce more cracking than necessary. But we also don’t want to dry it too slow because we have to make money,” he adds. After the wood is kiln dried, it must be checked again for MC. Ohio has lots of humidity in the summertime, but low humidity during the winter. So the wood is either expanding or contracting. “We notice that the finished wood, even a kiln-dried piece, expands and contracts in its width for the most part,” he says. Since Urbn Timber doesn’t have a climate controlled shop, the humidity inside fluctuates with the outdoor humidity. To ensure their wood is equalized with the environment before working on it, they continue to monitor its MC. And while they shoot for 6% to 8% MC, Hillyard says the wood normally equalizes at about 10%. Besides the exceptionally high-quality live edge products for which Urbn Timber is known, there’s another reason for its success – social media. By using social media daily, they’ve converted Facebook and Instagram posts and ‘likes’ into dollars and cents. “Social media has been a great way for us to grow our business and maintain contact with our customers. For instance, a lot of our customers love seeing their product being built. While we’re building it, we’re also sharing the process with them through social media. It gets them excited and makes them feel a part of the construction,” says Hillyard. Through social media, the company markets to a wide local audience. And when they post ads on Facebook and Instagram, it doesn’t cost them a lot of money. “We just spend some time every morning making sure we have a post out there – reminding people what we’re doing and that we’re still around,” he remarks. Based on Urbn Timber’s performance to date, they should indeed be around for a long time. After all, you take high-quality, elegantly crafted live edge wood products, three dedicated partners working tirelessly every day, and an impactful social media strategy – and you have a winning combination for success.